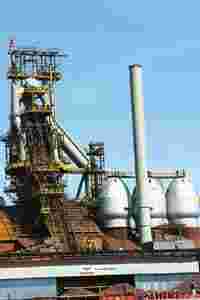 Overseas presence: A blast furnace of the Essar Steel Algoma Inc. plant in Canada. The firm is investing C$135 million in a co-generation plant to produce power using waste gas from the steel plant. Sault Ste Marie, Canada: The Canadian subsidiary of Essar Steel Holdings Ltd is expanding output by one-fourth to meet expected demand, building a facility to generate its own power and putting in place additional environmental safeguards, as it seeks to cement its place in the North American market, according to company officials. The unit, Essar Steel Algoma Inc., is targeting an increase in production to 4 million tonnes (mt) by 31 March 2009, from 3.2mt now, after budgeting 170 million Canadian dollars (about Rs750 crore) for capital expenditure, said Sandeep Dixit, vice-president for finance at the Sault Ste Marie, Ontario-based firm. And, it is spending C$90 million to put in place systems to reduce air emissions from the steel plant. Essar Steel acquired Algoma Steel in June 2007 for C$1.85 billion, and in the following October bought Minnesota Steel for an undisclosed sum, expanding outside of India and seeking to build a presence in the North American market. The group plans to boost steel production more than two-fold by 2012, from 9mt now. Essar Steel Algoma, which employs about 3,500 people, has raised annual production to 3.2mt from 2.4mt, to meet demand in North America, and posted record Ebitda (earnings before interest, tax, depreciation and amortization) in the quarter ended 30 June. “We have successfully implemented the best technological and engineering practices from across both the organizations," said Armando Plastino, chief operating officer of Essar Steel Algoma, in a statement distributed to a team of visiting journalists from India. “This has resulted in a 30% improvement in productivity. The integration has produced positive results, with both organizations aligned with a view to growth." In the fiscal first quarter, the privately held company generated C$204.3 million Ebitda, C$132.9 million more than in the preceding three months, the statement said. In December, the company paid C$135 million of debt. It had C$165.7 million of unused credit lines available as of 30 June. The purchase of Minnesota Steel handed Essar Steel high-quality iron ore reserves estimated at 1.4 billion tonnes, which will start feeding the steel plant in this Canadian town in about two years. The company plans to develop an integrated steel plant in Minnesota in six years. Essar Steel Algoma is also drafting a plan to build a so-called state-of-the-art port on the western perimeter of the 2,000-acre Sault Ste. Marie facility to handle more ships and meet rising demand for raw materials including iron ore and coal, said company spokeswoman Brenda Stenta. Demand for iron ore is seen growing to 5.7mt from 4.64mt, and that for coal to 2.3mt from 1.7mt with the planned increase in capacity, she said. “It is a plan and it is a vision, but we are nowhere near a timeline yet," said Stenta. “We are talking to community partners and other industrial players that want expanded capacity." Local companies that have shown interest in partnering Essar Steel Algoma in the project include Tenaris Algoma Tubes, a maker of steel pipes, St Mary’s Paper Ltd and marine services and equipment firm Purvis Marine Ltd, she said. Demand for steel is expected to slow in the face of a global economic downturn and prices are already beginning to soften after surging in the year to July, but Essar Steel officials say the company has derisked its business by keeping costs low, and through its geographical spread and value-added production targeted at industries including oil, general engineering and automobiles. “If there is a recession in one industry, we can focus on another," said a Mumbai-based spokesman. “And if you are able to save on costs, you can ride it out unless there are cash losses. We are among the top 20 percentile of lowest-cost producers. The remaining 80% have to get hit before our turn comes", he added. Anil Penna was in Sault Ste Marie as a guest of Essar Steel.